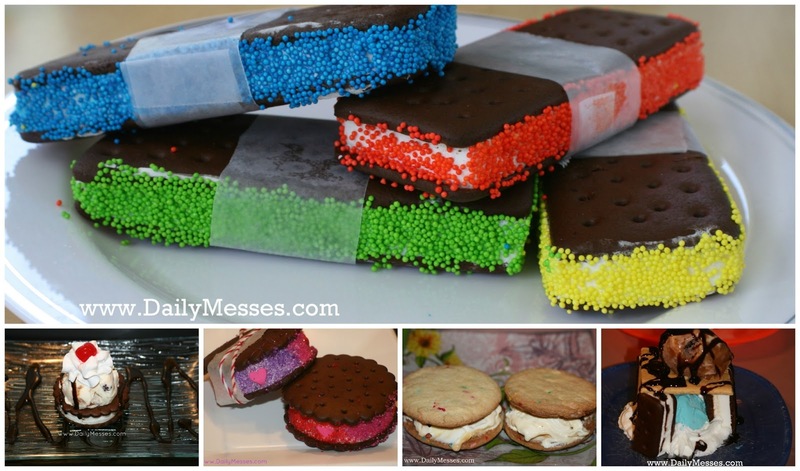 Daily Messes: It's Ice Cream Sandwich Time Again! It's Ice Cream Sandwich Time Again! Today is National Ice Cream Sandwich Day! We happen to be big fans of ice cream, especially in the summer. Last year, we baked sugar cookies and made our own ice cream sandwiches. We also experimented with store bought sandwiches and had fun making some yummy creations (see links below). This year, we tried a new variety: Neapolitan Ice Cream Sandwiches. They were a huge hit! National Ice Cream Sandwich Day, 2012. We baked cookies and make our own ice cream sandwiches! Big Wheeled Ice Cream Sundaes. Hubby used an ice cream sandwich as the base for a yummy sundae for the kids.